.::IamZulaikha::. 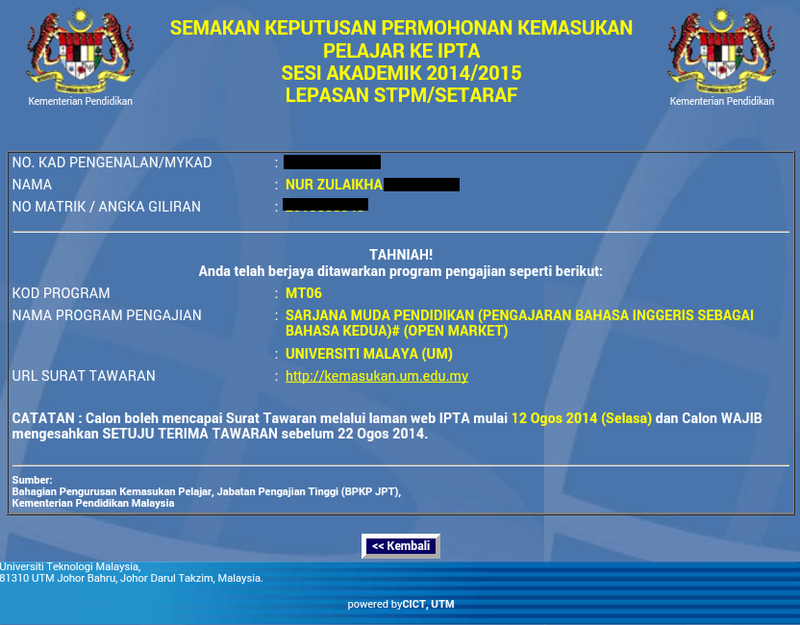 II: Degree in TESL at UM.... and this time, for real. Degree in TESL at UM.... and this time, for real. Well, well, well. It is out! The results for which university I'm heading to for degree. Degree in TESL that is! I was offered three, UM, UiTM and UIA. Attended UM and UiTM. And guess what?! I got into UM! Whoop whoop! Although I must be honest, I was kind of hoping for UiTM but I know that He has planned everything so well. So I'll just accept it. Truthfully, I did not expect to get UM at all. It's because I think I did bad during the interview. Plus UM is a place for all those smart and hardworking people. Here I am, with average pointer of 3.4 something. There they are, those people with pointers above 3.5. Whoa whoa. I haven't even started or even registered and I can already feel the pressure. It scares me so much. I have been thinking about it since I got to know who else were accepted into the course. Them smart people. T_T Here I am, lazy as heck and I got accepted into UM. What sorcery is this. But then again, I am still and truly grateful for this opportunity. It's fun to be studying where my parents and sister did. Well, at least I hope it will be fun. I haven't even started and I already think about all of these. Wow, wow, wow. I have no idea where my train of thoughts is going. I sure hope I will be able to do well. In sha Allah. With His guidance, I'm going to be alright. I just hope that I won't stray away like I did during first semester of foundation. Gotta stick with the right friends. Yep. Okay, I guess that is all for now. Oh, right. It starts on the 1st of September. IN TWO WEEKS. I'm so not done hibernating. Well, I guess things need to start moving now. By the way, here's a post about the interview for this course that I attended a couple months ago. Click it! The interview for UiTM TESL Degree was the same for Foundation I think? There was a test where you have to write an essay and after that there was an interview. Pretty much the same right? Hehe. Oh, sure.. it's gmail and my username is ecachan :) You can find me on Twitter too. All the best in your studies! Which band did you score in MUET when you first applied for UM? hi, im from asasi sains in uitm. Since im from asasi sains, can i still apply for tesl in um? Halluuu anon, I got band 4. I think it's the requirement to get into UM. I was wondering when you applied for the upu, did you applied for the same course for the three universities that offered you?